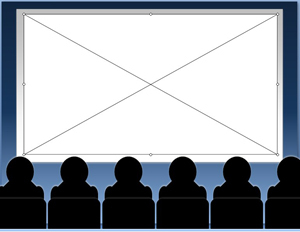 I am often asked how to get YouTube videos into a PowerPoint presentation, and, unless you're using the latest version (PowerPoint 2010), it's an understandable question... it's not a simple process. Over the next few weeks I will show you how to insert YouTube videos into PowerPoint 2007 (both with and without an internet connection) and PowerPoint 2008 for the Mac. 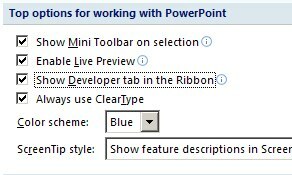 In PowerPoint click the Office button. From the Popular category, select Show Developer Tab in the Ribbon. Go to YouTube and locate the video you would like to insert into your PowerPoint presentation. Back in PowerPoint, select the Developer tab and from the Controls group, select More Controls. The More Controls dialog box appears. 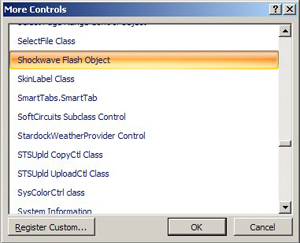 Scroll down and select Shockwave Flash Object. Your cursor should now look like a cross, an indication that you can draw a box. 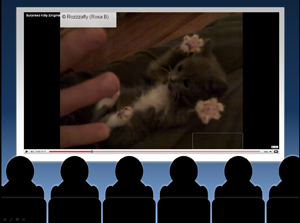 Draw a box on your slide and size it as desired to contain your video. Do not worry about making it perfect, you will be able to size it later just like any other shape. With the box you have just drawn selected, click Properties on the Developer tab. Locate Loop and select False from the drop-down menu. This step will keep your video from looping. Locate Playing and select False from the drop-down menu. This step will keep your video from playing automatically. Locate Movie and paste in the URL for the video you would like to use. Find in the URL where it says watch? and delete it. Change any instance of = in the URL to a /. Example: http://www.youtube.com/watch?v=0Bmhjf0rKe8 would be changed to http://www.youtube.com/ v/0Bmhjf0rKe8. When you play your slideshow, your video will appear just like it would on YouTube, ready to be played. About the author: AJ George is IconLogic's lead Technical Writer and author of the book "PowerPoint 2007: The Essentials" and "PowerPoint 2008 for the Macintosh: The Essentials." You can follow AJ on Twitter at http://twitter.com/andrayajgeorge. I thought I'd share the how-to for embedding a video in Office 2010. It's got a little video demo, so you can check it out since you haven't had a chance to test out Office 2010 just yet. Thanks for showing this great tip for PowerPoint 2007 users. This did not work for me. There must be a step missing or something. I went through every step required (twice), but the video did not replace the big square with an X in it. It just remains a square with a box in it after changing the properties within Shockwave Flash Object. Never mind...missed the bit about the slideshow. Thanks.